Holotype ("Type" in Trewavas, 1955): BMNH 1953.12.31:1 47.5mm SL. Paratype: BMNH 1953.12.31:2 43mm SL. This species is the type-species by original designation and monotypy of the cave-restricted genus Typhlogarra. Type locality: a "sink-hole" (= small natural chamber in floor of quarry, phreatic zone exposed) near to the Sheik Hadid Shrine, 500m west of the Euphrates on the northern outskirts of the town of Haditha (34o04'N, 42o24'E). This is also the type locality of Caecocypris basimi and the two species coexist. The only other known collection site is the Pigeon Hole, 12 km south of the type locality. A cave dwelling fish was collected from this site around 1950 (Widdowson 1954) but was lost and not identified. A specimen in the BMNH (BMNH 1960.3.1:31) is recorded from this site thus confirming the presence of the species. In a study of intra-populational variation Niazi (1965) was only able to obtain specimens from the type locality. Nothing known. The collection locality is simply a small window into the local phreas. Post (1965) reported that the haploid chromosome number (n) for this species is 24. This appears to be the plesiomorphic state for many teleosts. Niazi (1965) examined 69 specimens (juvenile to adult, 12.0mm - 47.5mm SL) and showed that there is a degree of intra-populational variation within the species. 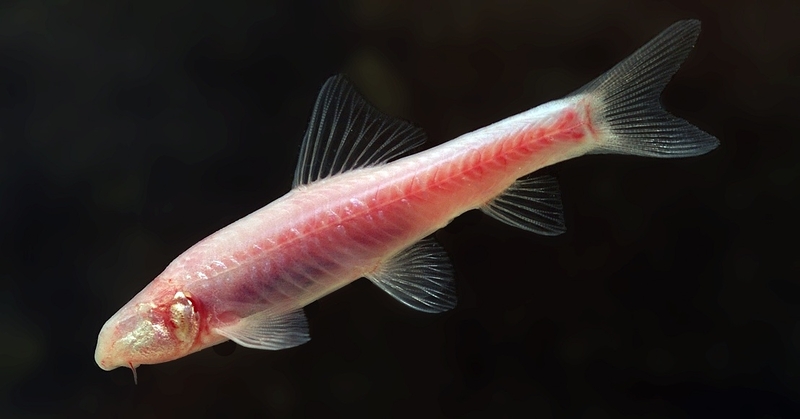 This species belongs to a monophyletic group termed 'labeine cyprinids' by Reid (1978, 1982), where it is joined by other cave-dwelling species, (Garra longipinnis, Garra typhlops, Garra anduzzii, Garra dunsirei, Garra lorestanensis and Garra tashanensis) Howes (1991) accepts this placement, calling it the labeine lineage which is member of the subfamily Cyprininae. Freyhof, J. 2014. Typhlogarra widdowsoni. The IUCN Red List of Threatened Species 2014: http://dx.doi.org/10.2305/IUCN.UK.2014-1. RLTS.T22601A19006932.en. Downloaded on 03 July 2017. R (IUCN 1990), R (IUCN 1994), VU D2 (IUCN 1996). As above plus: BMNH 1955.11.23:1-2, 1960.3.1:31, 1979.9.4:7-13 (13 alizarin preparation), 1979.9.4:35-36, 1981.9.21:36-47.